There are perhaps hundreds, or at least dozens of medicinal foods and herbs that deserve a place in your kitchen’s herbal medicine cabinet. But for someone who is just getting their feet wet in the world of herbalism and natural healing, collecting numerous herbs can be overwhelming. For that reason, we’ve chosen 4 healing herbs to get you started—herbs that should be the cornerstones of every natural healer’s arsenal. From calming upset stomachs to killing cancer cells, these 4 herbs have been shown time and time again to provide incredible healing powers. Turmeric has numerous health benefits and is easy to incorporate in your cooking. The spice can reduce inflammation, fight depression, cut heart disease and diabetes risk, and has been researched extensively for its ability to beat cancer. 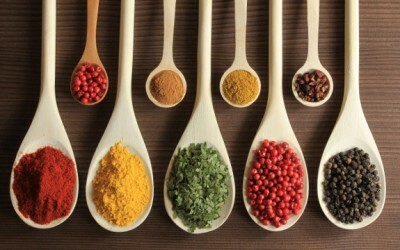 Scientists from around the world have found turmeric to positively impact over 581 different diseases and conditions. 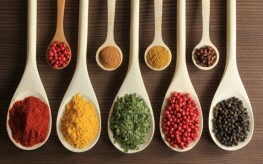 It is one of the most well-researched spices on the planet. While we commonly think of turmeric as the yellow spice in curries, you can reap it’s medicinal benefits in other ways as well. Golden milk tea or golden milk is one way people from the Middle East have taken turmeric for ages. Just make sure you know how to optimize turmeric absorption to reap the most benefits. Like turmeric, ginger is a root. Also like turmeric, the health benefits of ginger are amazing. The herb is particularly good at calming digestion, but can also fight cancer, inflammation, and boost your immune system. Ginger tea is an elixir that can be used for colds, sore throats, and upset stomach. Simply simmer some slivers of ginger in water for 5 minutes, cool slightly and drink. Add a little local honey to supercharge it’s benefits. It’s not just for pizza; oregano has healing qualities that go far beyond its culinary allure. It’s loaded with vitamin K and manganese, and is packed-full of antioxidants and phytonutrients. Research has linked this culinary herb with weight loss, digestive health, combating foodborne pathogens and relieving pain. Oregano is anti-bacterial, anti-fungal, and anti-inflammatory. You can grow your own oregano quite easily and then use it fresh or dried, or find oregano oil in health food stores. Another culinary herb, basil has many health benefits as well. Its antibacterial properties make it a contender for fighting serious infections including listeria monocytogenes, staphylococcus aureus, and E. coli. The herbs high levels of the flavonoid zeaxanthin make it a great solution for protecting eye health and preventing age-related macular degeneration. Also like oregano, basil is easy to grow. Here are some other holy basil benefits. Starting a healing kitchen doesn’t have to be overwhelming. These four healing foods are a good place to start. my mother always gave us oregano + thyme and another herb I can’t remember when we were very little. At school age we never got sick my brothers and I. NEVER MISSED A DAY OF SCHOOL we ate lots of fruit (berries, pomegranate, apples and the very high in vitamin C, ACEROLLA berry. sorry but you forgot THYME more important than basil. (even basil is a fad, thyme has lots more benefits and have same antibacterial and antivirus elements than oregano. Cinnamon is a wonderful spice!!! yes in small quantities. but how do you know what to give a baby if he reacts like that? how there them do something like that to a small baby!? my babies didn’t get their shots until they were 3 months. old why are they doing this now/ are they so hungry for money that they need to start giving vaccine just two days after being born? Please I need to know how to get away with out the vaccinations for at least several months or years without getting into trouble? Is there any way to do it? my daughter is going to have a baby and i ABSOLUTLEY DO NOT WANT ANYONE TO DO THIS TO HER BABY. I use organic sweet basil tea for fevers, headache, diarrhea, vomiting, nausea and stomach aches. When my 2 month old baby got his DPT shot and within 1 hour began to vomit and have a raging fever & wouldn’t nurse… it was spoonfuls of sweet basil tea that was the remedy! You must do everything you can to prevent them from giving him any more vaccines. Vaccines are a total scam and are responsible for many things, such as autism, sterility, slowness, and illness in later years. Do the research. Home school if you must. Meg maybe you should get your facts straight before commenting on vaccines! My son was immunized two days after he was born. Straight after the immunization he had to be rescuscitated, was never the same again. He is autistic and after so much testing,which doctors could not find the problem,later was diagnosed with autism. No one Can tell me vaccines are not harmful as my son is living proof. Before you comment with hogwash! Do some research first moron! why they do that? OMG, what were they thinking? who are they to do something like that with out asking parents first? did you sue the A&%$ and the hospital? you should. But… as for basil: are we talking of common basil (the one used on pizza for instance) or holy basil, aka tulsi? I mean: does common basil have some of the healthy features of tulsi? No it does not, and it should have been written to reflect that. They are different cultivars, Holy Basil having the health benefits. Thank you. I was thinking the same thing. I thought she was talking regular basil. where can you find holy basil? I guess I need to plant some this coming year in my very small garden. thanks again.